What’s an RD to do with this important health information when it comes to counseling vegan and vegetarian clients who won’t violate their deeply held convictions about eating only plant-based foods? Luckily, there are a variety of algae-based DHA+EPA supplements on the market that can help vegetarians and vegans obtain adequate levels of these important nutrients. Most RDs likely will recommend clients acquire nutrients from food sources rather than supplements for a variety of reasons. Plant foods such as flaxseeds, chia seeds, walnuts, edamame, and certain vegetable oils contain the omega-3 fat alpha-linolenic acid (ALA), and the body converts some ALA into DHA and EPA. However, this conversion rate is poor, making it possible but not likely that vegans and vegetarians can consume enough ALA to obtain adequate EPA and DHA. Vegetarians may get trace amounts of EPA and DHA through dairy and eggs if the animals were fed an ALA-enriched diet, but those amounts aren’t close to what’s needed to attain the health benefits of these fatty acids. Ginny Messina, MPH, RD, a vegan nutrition expert and coauthor of Vegan for Life, Vegan for Her, and Never Too Late to Go Vegan, agrees that it’s, at best, an upstream battle for vegans and vegetarians to try to get enough EPA and DHA through their diets. “It’s likely that vegans [and vegetarians] may need to consume higher amounts of ALA to achieve [adequate EPA and DHA],” Messina says. “But even then, there is no guarantee.” As such, she recommends DHA+EPA supplementation “as a precautionary measure. Given all of the questions we have about the relationship of DHA and EPA intake to chronic disease risk, it’s not clear that the typically lower blood levels of these fats in vegans [and vegetarians] is a problem. But, of course, we don’t know that it isn’t a problem.” As a result, Messina believes RDs should be prudent to recommend algae-based DHA+EPA supplements to their vegetarian and vegan clients. All vegan/vegetarian DHA+EPA supplements are derived from algae instead of fish or krill. While research on algal oil supplementation is limited, studies so far have suggested that its bioavailability and subsequent health benefits are comparable to that of fish- or krill-based DHA+EPA sources.6 Furthermore, it’s a completely natural and original source of DHA and EPA; these fatty acids are found in such high quantities in fish because they consume the algae or eat other fish that consumed algae. In addition, there are environmental benefits to choosing algal oil; overfishing (catching fish at rates higher than fish can reproduce) negatively affects ocean food chains, increases global food insecurity, and destroys coral reefs, contributing to climate change.7,8 Suffice to say, algae-based DHA+EPA supplements are a much more sustainable choice than fish-based supplements. Messina recommends vegan and vegetarian clients consume 200 to 300 mg combined DHA+EPA two or three times per week, suggesting that those aged 60 and older take this amount every day. The table below outlines common brands of vegan DHA+EPA supplements and how much of each fatty acid they contain. One challenge clients may face when seeking algae-based DHA+EPA supplements is cost. 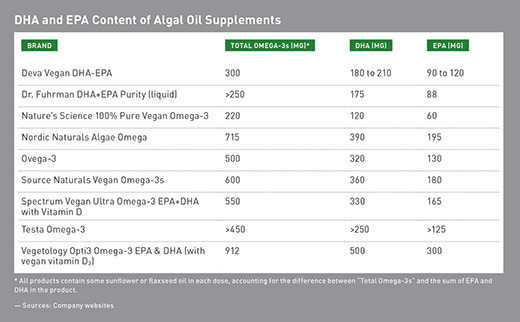 Algal oil supplements can be pricey compared with fish- or krill-based omega-3 supplements. Messina says that while there’s no ideal solution to this problem, educating clients on how much DHA+EPA they need can help their dollars go further. In addition, a consistent issue with supplementation is its lack of regulation, and this is just as true for algal oil supplements. None of the algal oil supplements currently on the market have been tested by independent organizations, such as the US Pharmacopeia, ConsumerLab.com, or NSF International, to be sure they contain the amounts of the ingredients listed on the labels and don’t contain contaminants, something RDs should keep in mind when counseling clients. — Hadley Turner is an editorial assistant for Today’s Dietitian. 1. Melina V, Craig W, Levin S. Position of the Academy of Nutrition and Dietetics: vegetarian diets. J Acad Nutr Diet. 2016;116(12):1970-1980. 2. US Department of Health & Human Services. Dietary Guidelines for Americans 2015–2020: Eighth Edition. https://health.gov/dietaryguidelines/2015/guidelines/chapter-1/a-closer-look-inside-healthy-eating-patterns/#callout-seafood. Published January 7, 2016. Accessed August 25, 2017. 3. Eating fish for heart health. American Heart Association website. http://www.heart.org/HEARTORG/HealthyLiving/HealthyEating/Nutrition/Eating-Fish-for-Heart-Health_UCM_440433_Article.jsp#. Updated May 15, 2015. Accessed August 25, 2017. =&Qv=1&ds=&qt=&qp=&qa=&qn=&q=&ing. Updated May 2016. Accessed August 15, 2017. 5. Swanson D, Block R, Mousa SA. Omega-3 fatty acids EPA and DHA: health benefits throughout life. Adv Nutr. 2012;3(1):1-7. 6. Lane K, Derbyshire E, Li W, Brennan C. Bioavailability and potential uses of vegetarian sources of omega-3 fatty acids: a review of the literature. Crit Rev Food Sci Nutr. 2014;54(5):572-579. 7. Ecosystems. Food and Agriculture Organization of the United Nations, Fisheries and Aquaculture Department website. http://www.fao.org/fishery/ecosystems/en. Accessed August 28, 2017. 8. Jetson K. Impact of overfishing on human lives. Marine Science Today. April 9, 2014. http://marinesciencetoday.com/2014/04/09/impact-of-overfishing-on-human-lives/. Accessed August 28, 2017.